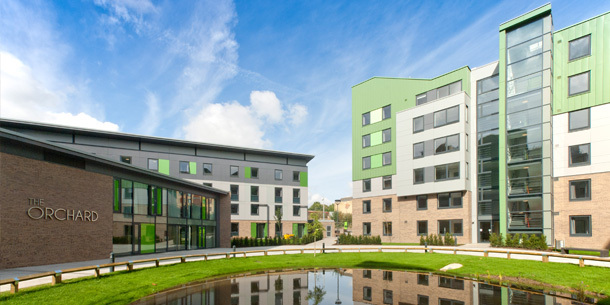 A £40m ground-breaking eco-friendly student village at the University of Bradford campus has opened and has been awarded the second highest ever BREEAM score at 94.11%. The Green is one of only 15 buildings in the world to achieve BREEAM’s highest classification of ‘Outstanding’. The unique development was designed by GWP Architecture and was managed by Mi7 Developments since its inception in 2005. It was constructed by GB Building Solutions in a joint venture with Balfour Beatty Engineering Services with strategic consultancy from the BREEAM assessors, GWP Project Services. Consisting of 1,026 bedrooms across four-storey townhouses and six and seven storey apartments, the BREEAM rating has been made possible through meticulous planning of the design and construction methods. GWP Architecture brought their experience in the field of sustainable student accommodation to the development and extensive work was required to ensure the buildings could deliver an exceptional performance for sustainability. The design used a ‘fabric first’ approach to deliver a highly efficient building envelope which minimises the need for space heating. The largest heating load is for hot water, which is provided by a renewable energy source in solar thermal collectors, which are supplemented by a combined heat and power plant. The Green is the initial phase of the Bradford Learning Quarter, a key regeneration area of Bradford city centre. The Learning Quarter includes major projects at both Bradford College at the University of Bradford, and the projected investment into the area over a 10-year period is £750m.